Hawaii has the remarkable characteristic of being able to immediately conjure up a vibrant array of imagery and memories for people who have both visited and those who haven’t had the chance yet. We instantly picture white sands, palm trees and turtles, can almost hear the soft ukulele notes and can almost see the postcard sunsets. Something that we associate (and rightly so!) with the beautiful islands are the widely celebrated luau’s, with Maui luau’s being no different. The proud depictions of Hawaiian and wider Polynesian culture enjoyed by tourists and locals alike have given us some of our most treasured memories of times spent in Hawaii. At its simplest, a luau in Maui is a feast. People of all ages get together to eat and be merry – something particularly enjoyed thanks to the jaw-droppingly beautiful beaches Hawaii has to offer, back-dropped by gorgeous colourful sunsets. At its most meaningful, a luau is an almost 200 year old celebration of Hawaiian culture, held to signifying great endeavours and the unity of people. What’s really noticeable is that in all the luau’s we’ve attended – the emphasis is on getting that important message across to visitors. Though they’re now widespread and commonly enjoyed, the celebration of culture and unity is always beautifully apparent, making it consistently one of the top tours in Maui for vacationers. Now on to the matter at hand – we’ve established that to miss a luau when in Hawaii is essentially criminal but we’ve also established that they’re wildly popular, widespread and varying. The common toss-up is between a luau suitable for families and those that are less crowded and intimate. Neither will disappoint when it comes to enjoyment but it’s nothing out of the ordinary to have a preference when it comes to atmosphere – and with so many to choose from, you can afford to pick what works for you! Maui is well-known for hosting some of the most memorable luau’s in the whole of Hawaii. The abundance of pristine coastline provides some truly beautiful settings to host celebrations and for that reason, some of the best are held here. We’ve pulled together a comprehensive, honest guide to what are undoubtedly the best luau’s on the island of Maui. Each as enjoyable as the next and varying for personal preference, read on to find out where your next Maui luau experience will take place. Widely recognized as being the best of the best when it comes to the luau’s found on Maui, The Old Lahaina Luau takes place on the oceanfront of Lahaina, West Maui. Instantly recognisable in the distance are the beautiful islands of Lanai and Molokai, the sun slowly setting, the location could not be more perfect and that’s before the celebration has even started. This traditional luau showcases everything from traditional to contemporary Hawaiian hula, tantalizes onlookers with passionate dancing and holds lei ceremonies to represent individual’s devotion to one another. In the spirit of taking part, guests are also invited to take hula lessons and artists are also present to demonstrate a variety of native crafts. What makes the Old Lahaina Luau stand out is the sheer quality of food, drink and entertainment, rivalling even the best dinner cruises Maui has to offer. Bolstered by award-winning restaurants such as Leoda’s Kitchen, the menu is outstanding to say the least, boasting signature Kalua roasted pork, pulehu steak and nothing but the freshest seafood and salads. Perfect for large parties and families, this luau truly is a spectacle, making it a firm and justified leader in the industry. Be sure to book in advance even though the 400 plus venue is open every day, places run out extraordinarily quickly! To book The Old Lahaina Luau, go here. Ask any local in Maui and they’ll tell you that the Feast at Lele is also one of the best luau’s around. With the same spectacular views that are to be expected on the west coast of the island, the Feast at Lele sets itself apart as it’s the only luau that seats you at private tables. Rather than family style seating and buffet lines, you’re treated to award-winning food served directly to the table. Hailed by some as “the most fabulous cooking on Maui”, each course is accompanied by a dance hailing from a different Polynesian culture. Expect traditional dishes like fafa (steamed chicken and taro leaf in coconut milk) to be paired with Samoan performances and eiota (raw fish) to be complemented by New Zealand dances. A truly unique and immersive experience, it’s worth every penny of the slightly higher price. To top it all off, you’re treated to a death defying fire-dance at the end of the evening. The night itself we might add also runs for around an hour longer than the usual 3 hours. If you’re after something a little different for incredible value for money then don’t miss the Feast at Lele, which you can book here. Infants age 2 & under are no charge as long as they are able to sit in someone’s lap or in a highchair throughout the evening. With an undeniable focus on the divine beings that Hawaiian mythology was built on and the adventures of the original Polynesian settlers, The Grand Luau takes place on the picturesque seafront at Honua’ula. If a mix of traditional and unique appeals to you then this might be your perfect evening. You’re treated to traditional hula dances and spectacular fire shows alongside a cirque-du-solei inspired performance and a parachute hula. Served alongside yet again truly excellent food, this luau effortlessly merges its unique blend of teaching and celebration with a genuine family atmosphere. Noticeable in the split in pricing, it’s an overtly child friendly event – though you’ll be glad to hear this doesn’t in any way detract from the experience. Take the first two young children free and pay only a fraction of the price for any after them. It’s worth noting that The Grand Luau only runs on Monday, Thursday, Friday and Saturday – with the weekend days usually being the busiest. 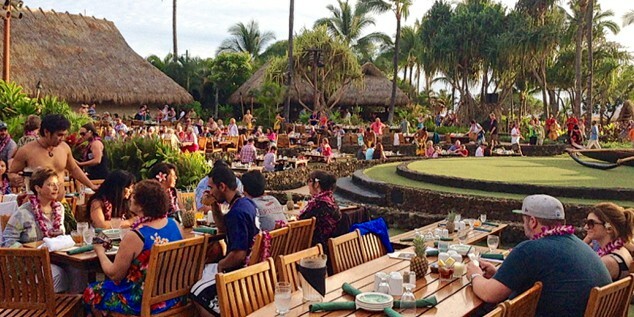 To snag your reservation to this awesome Maui luau, go here. The clue is well and truly in the name when it comes to this Luau. Similar to the Feast at Lele, the emphasis with this experience is on the stunning variety of music and dances from Polynesian culture. Even the seating is laid out in a concert hall style, with higher priced tickets getting you a seat in the rows nearer the action. The location itself deserves a mention also! The Drums of the Pacific take place in the beautiful grounds of the Hyatt Regency Hotel, on their famed Sunset Terrace overlooking Ka’anapali Beach, one of the most gorgeous vistas we came across in the whole of Hawaii. The hotel setting is perfect if you’re with children or even just a guest at The Hyatt. The range of entertainment really is apparent, with everything from Polynesian fashion shows to faithful representations of authentic dances from Tonga, Tahiti, old Hawaii and many more. Accompanied by a delicious buffet, the Drums of the Pacific is without a doubt among one of the best performances we saw. If you’re looking for a fun time with a beautiful view, you can book this Hyatt Maui luau by going here. Feature authentic dances and music of the old Hawaii, Tahiti, the Tuamotus, Rarotonga, New Zealand, Tonga, and a thrilling 3-man Samoan fireknife finale in the hottest Lu’au Show in the Islands. Polynesian fashion show featuring the islands most exotic pareaus (sarong) worn in creative styles. Situated on the same beach (Ka’napali), the Royal Lahaina Luau is the longest running luau in all of Maui. It’s withstood the test of time and it’s no surprise that this is the case. At an extremely reasonable price of $90 per adult, making it the cheapest option on our list, you’ll enjoy a superbly dynamic show with a similar array of performances from differing cultures. A favorite amongst attendees and one we can fully attest to is the finale, which takes form of an awe-inspiring Samoan fire-knife dance. Running for an extra half hour than the normal 3 hour duration, the value for money with the Royal Lahaina is really unsurpassed. The attention to detail in every aspect even extends to a special menu for Keiki (Hawaiian for children) and vegan and gluten free options. The height of hospitality at an astounding price, expect another well-rounded, idyllic resort luau. In line with seasonal swells of visitors, you can experience the Royal Lahaina Luau daily from June until August and every day except Saturdays from September until May. Hailing from the iconic Wailea Beach Resort and Spa, the Te Au Moana is as close to the ocean as you can possibly get. With performances taking place at the edge of the water and the Maui moon starts twinkling over them, the “Ocean Tide” luau really does justice to its name. With a greater emphasis on integrating the audience with the artists, you’ll be delighted to find you can take part in various flower crafting workshops, Kapa and bookmark making and other Polynesian crafts. This actually proved to be the perfect way to create a relaxed, laid-back atmosphere, something the more performance focused luau’s may have lacked. As the priciest event, we can fully attest to the quality of the experience, indeed, the name “Luau Experience” is fully deserved as you really feel like you’re part of the evening instead of just watching it. As is to be expected, the food is restaurant quality and this along with the entertainment can be enjoyed on a Monday, Thursday, Friday and Saturday. For more info and to make reservations to this Maui luau, click here. As you can imagine, it’s a near impossible feat to attend a Maui luau and not have a good time. But in the interest of giving you as much of a head-start as we can, we hope you’ll be able to narrow down your options with the summaries of our chosen favourites. First timers may want a more well-rounded experience, foodies will inevitably opt for the award-winning eats and culture enthusiasts have got their corners well and truly covered too. All we can hope for is that in your efforts to find your perfect Maui Luau, you have as much fun as we did!